The U.S. sister city program began in 1956 when President Dwight D. Eisenhower proposed a people-to-people, citizen diplomacy initiative. Originally a program of the National League of Cities, it became a separate, nonprofit corporation in 1967, due to the growth and popularity of the U.S. program. 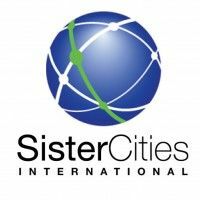 Sister Cities International is a nonpartisan 501(c)(3) nonprofit which serves as the national membership organization for individual sister cities, counties, and states across the U.S. This network unites tens of thousands of citizen diplomats and volunteers in over 500 member communities with over 2,000 partnerships in 145 countries on six continents. The organization "strives to build global cooperation at the municipal level, promote cultural understanding and stimulate economic development". As the official organization which links jurisdictions in the U.S. with communities worldwide, Sister Cities International recognizes, registers, and coordinates sister city, county, municipalities, oblasts, prefectures, provinces, regions, state, town, and village linkages. Sources: http://www.sister-cities.org/about-sister-cities-international, http://www.sister-cities.org/mission-and-history and https://en.wikipedia.org/wiki/Sister_Cities_International. The flag is the logo (https://s-media-cache-ak0.pinimg.com/originals/55/d3/d0/55d3d06bacf6a5abdf9713c836c9053e.jpg) on a horizontal flag.